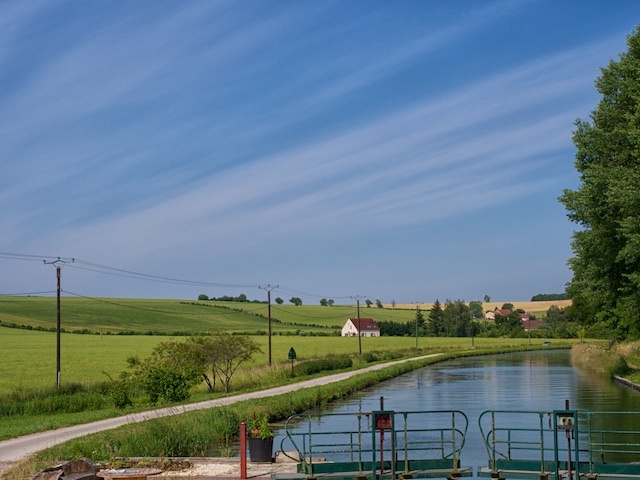 Imagine cruising through the Burgundy countryside for a week, the master of your own vessel, no permits or licenses necessary. Being the master of your own boat is so easy that the hire companies by and large don’t even need to provide basic instruction on their use. It all sounds so serene, so idyllic, and mostly it is. Occasionally though, on days like today, yesterday and tomorrow, a great wind arrives when one least expects it. When one does expect it and sets up one’s manoeuvre accordingly it arrives in even bigger gusts from exactly the opposite direction. These are the days we feel sorry for the boat hirers. With even a week at the helm they have little chance of coming away with memories described in the brochures. At best they will remember being embarrassed as their boat hits every solid object along the way or at worst they will leave in separate vehicles, their voices worn hoarse from shouting at one another. While on the one hand, watching can be giggle inducing, there is no point in becoming smug because we know that we are but one big ill-timed gust away from looking like them. The family we followed today managed on occasion to keep its boat in the wet stuff, but only just, as lock after lock they collided with gates, crashed into walls trying to avoid collisions, or simply spun through ninety degrees when departing. It was a bit like watching a toddler playing with one of those shape games really, trying valiantly to fit the boat through the gates of the lock in every direction until they found one that fitted. No matter how much advice is given, little is taken. Offers of help rarely accepted. There is pride at stake as the captain invariably resplendent in his newly acquired skipper’s cap tries everything at full throttle. “Can I help you turn around?” I called to one such skipper as he pirouetted and smashed his way along the canal in the nautical equivalent of kangarooing a car along the side of a semi trailer. “I’m just getting my wife off and heading north.” He replied. She did end up ashore having taken an almighty leap, and was last seen striding purposefully off in direction opposite, while he continued on his merry way apparently oblivious to the fact that he had turned around in his panic, continuing over the horizon in a not northerly direction, never to be seen again. Sadly, I can only suspect that neither will be recommending hiring a boat to their friends. Ha ha. We are now the proud owners of our new 22ft caravan. Trying real hard not to be laughing stock of the caravan park … have managed to survive thus far by getting drive thru sites. We feel your pain! We've seen a few people here with neat little motors that are remotely controlled that drive their dolly wheels.